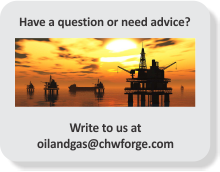 CHW Forge manufactures cost effective and consistently high quality flanges which are used by Oil Refineries, Petrochemical and fertilizers’ plants all over the world. CHW Forges manufactures standard and non-standard flanges (Weld-neck, slip-on, Socket-weld, lap-joint, blind and screwed types) in all Pressure ratings (150-2500 lbs). The flanges are manufactured as per international specifications and as per customer’s requirement. The non- Standard flanges can be manufactured upto a diameter of 4500 mm with weight not exceeding 5,000 Kg.